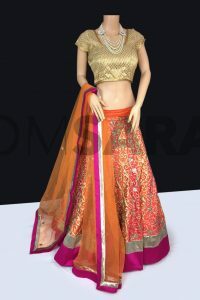 Designer lehenga choli in greyish and orange designed with heavy embroidered Zari, sequins, crystals and heavy foliage patterns with patch border work. The designer choli is unstitched. Comes with a contrast dupatta. The lehenga choli can be customised to fit sizes 34” to 42” max bust. 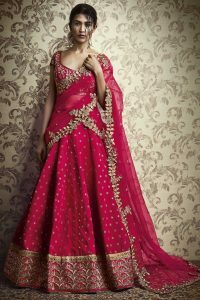 Lehenga length 46″. Waist max 40” hip 44″. Slight colour variation may be possible due to difference in monitor resolution. Jewels accessories on model are for photography purposes only and do not come with this outfit. Please note that stitching is not included in this and will require a professional tailor to customise.